Last year I responded to a post on Bacon’s Rebellion that raised alarms that Virginia’s economy was “tanking.” I argued that there really shouldn’t be concern over the idea that Virginia was on a death spiral while the rest of the nation was facing relative stability. Historically, this has tended to be the case for every state. But that doesn’t mean there aren’t concerns with the direction of the state’s economy. And new data shows some less-than-usual trends occurring in the Commonwealth’s labor market. New numbers released by the Richmond Federal Reserve reveal that Virginia’s year-over-year change hit zero percent in March. In other words, Virginia stopped adding jobs in March. 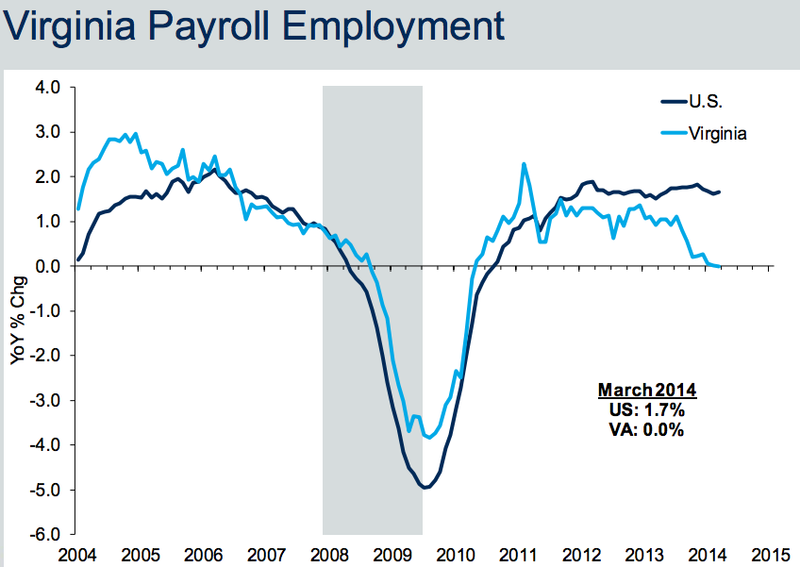 And if the trend continues, we’ll begin losing jobs in the near future. Graph by the Richmond Federal Reserve. What’s odd is that the unemployment rate continues to fall over this time period. 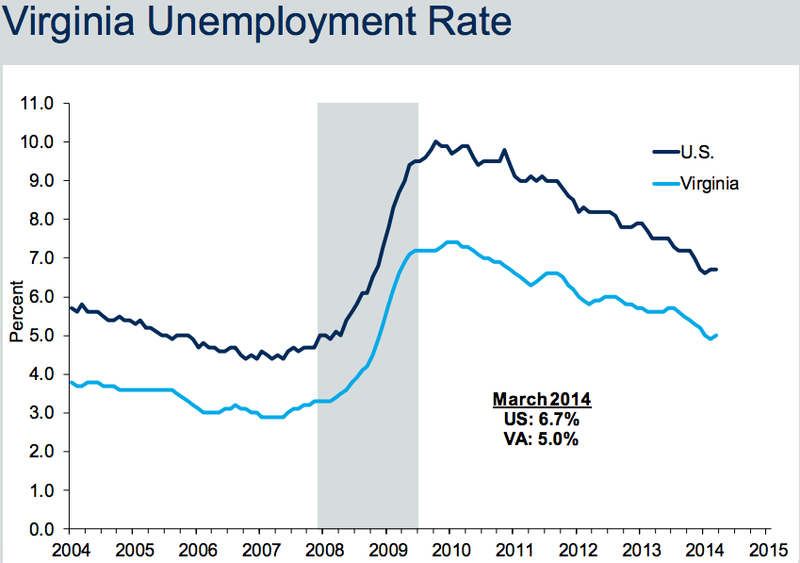 So how is it that the rate of employment is shrinking, but also the unemployment rate? One idea is that as the length of unemployment increases, people become discouraged and stop looking for jobs. Data from as recently as 2012 shows that the average duration of unemployment among those who receive benefits rose steeply between late 2011 and early 2012. Graph by Rui Pereira, College of William & Mary. This trend is not unique to Virginia. A number of economists and journalists have noted that lower unemployment rates aren’t being match by growing employment. Of course, always open to other suggestions. 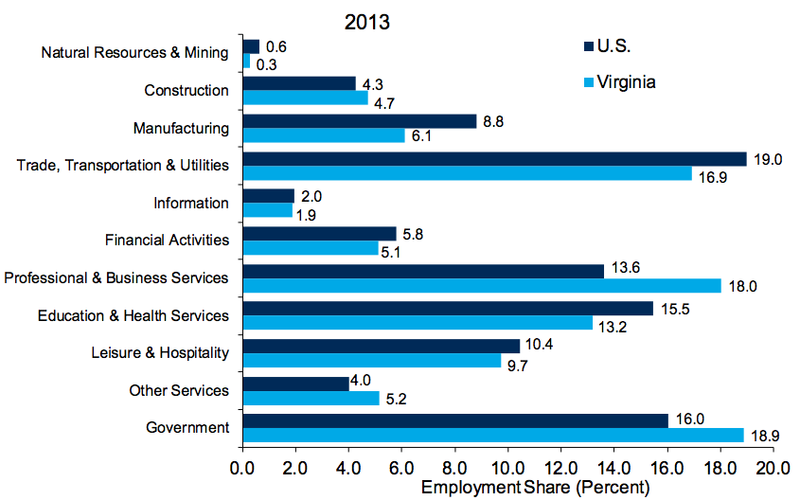 Bonus: Here’s an interesting chart with updated industry numbers in Virginia. 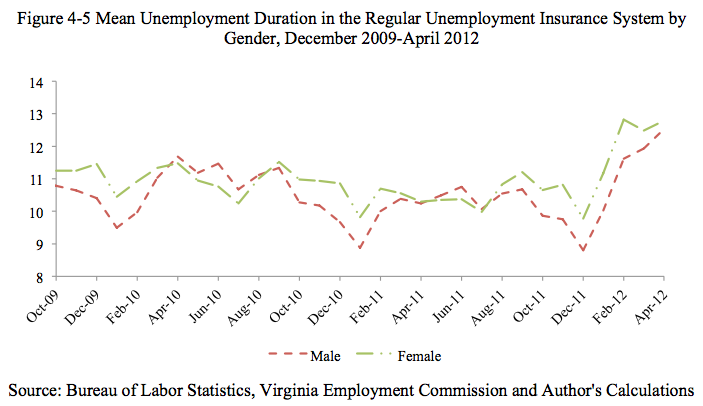 Chart by the Richmond Federal Reserve. Government now makes up the largest share of employment at 18.9 percent, closely followed by professional and business services and trade. Frank Muraca is the Executive Editor at Fourth Estate GMU, a weekly publication and an online presence. Fourth Estate covers everything from the Board of Visitors to the next concert coming to the Patriot Center. Frank also discusses everything Virginia politics on his website and can be found on twitter @FrankMuraca.